Investors can’t stay mad at Vietnam. Even after a downgrade last month by rating agency Moody’s, they’re willing to lend Hanoi dollars for less. Rising exports have helped restore reserves and avert a potential balance of payments crisis, while top officials have apologised for economic mismanagement. In a world awash with cash, however, investors are all too eager to forgive and forget. For a country whose bonds are rated as junk, Vietnam doesn’t borrow like one: last week, yields on its 10-year U.S. dollar bonds dropped to 4.18 percent – the lowest level since they were issued in 2010. That’s just 2.5 percentage points above equivalent U.S. Treasuries. The cost of insuring Vietnam’s debt has dropped to its lowest in two years. That’s all the more striking because earlier this year Vietnam looked like it might need financial assistance from the International Monetary Fund. 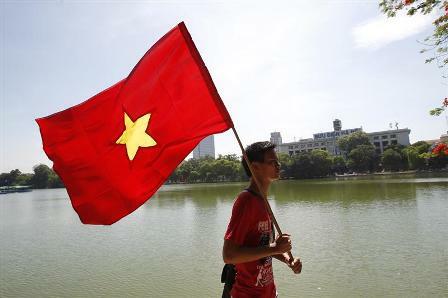 After years of overinvestment, corruption and half-hearted reform, Vietnam was hit by a correspondingly painful slump. Higher interest rates have lowered inflation to single digits from 23 percent, but growth has slumped, with the government projecting GDP expansion of 5.2 percent this year, below its target of between 6 percent and 6.5 percent. Slower growth has cooled import demand, allowing rising exports of clothing and electronics to pull Vietnam to a rare trade surplus. But after expanding at an average of roughly 33 percent a year between 2007 and 2011, credit has stalled, leaving banks saddled with nonperforming loans that likely exceed 10 percent of their total loan books. The prospect of a government bailout prompted Moody’s to cut Vietnam’s rating to the same level as sovereign delinquent Argentina. No wonder Vietnam’s prime minister felt obliged to apologize last month for mismanaging the economy. As far as investors are concerned, though, he needn’t have bothered. Vast money printing by central banks in the United States, Europe and Japan has sent a wave of cash searching the globe for higher returns. The influx has forced Hong Kong to fight to keep its own dollar from rising and prompted the Philippines to talk about imposing capital controls. When money is this hot, even Vietnam’s mistakes are quickly forgiven. Vietnam’s prime minister, Nguyen Tan Dung, apologized on Oct. 22 for “weaknesses and shortcomings” in managing the economy and called for the ruling Communist Party to work with the country to implement reforms more quickly and ensure order in its finances. Dung was addressing parliament a week after the party’s central committee criticised senior members and promised reforms. Dung noted success in some areas, such as bringing down the trade deficit, but he accepted blame for difficulties, including the lowest growth rate in seven years. Growth in Vietnamese industrial production slowed to 5.7 percent in October from the same month a year earlier, the General Statistics Office said Oct. 29, down from growth of 9.7 percent in September. Between January and October, industrial production rose 4.5 percent. Foreign direct investment into Vietnam fell 1.1 percent in the first 10 months of 2012, to $9 billion, according to the Planning and Investment Ministry’s foreign investment agency. FDI pledges in the January-October period fell 24.7 percent to $10.49 billion, the agency said Oct. 25. Prime Minister Nguyen Tan Dung told the parliament on Oct. 22 that Vietnam’s foreign exchange reserves had climbed to the equivalent of 11 weeks of imports, up from seven-and-a-half weeks at the end of September 2011.